This is Guang Cang, trying a brand new guitar. The guitar has my former rozet (concentric rings) and headstock. I especially built it for Guangs friend Christina Gai who lives in Australia. 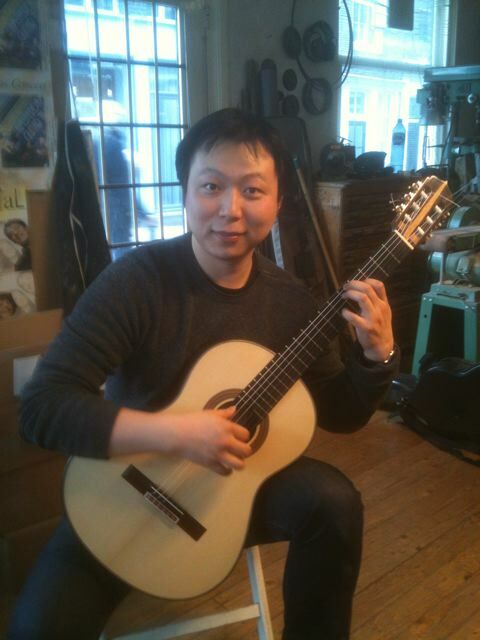 Cang Guan studied at the Beijing Guitar Society with the legendary Prof. Chenzhi and continued his studies in the Netherlands, with Zoran Dukic and Enno Voorhorst at the Koninklijk Conservatorium in den Haag. Living in the Netherlands, Guan became a friend of the family. Yesterday he moved back to China. We will miss him, but I am sure we will stay in touch. I’m sorry to hear that Oman, but I’m sure you’ll stay in touch.